Set in the kingdom of Arendelle, Disney’s animated film Frozen tells the story of the graceful Snow Queen Elsa, and her fearless sister Anna. This coin design features Anna and Elsa happily reunited in the kingdom of Arendelle. The words “Sisters make each day Perfect” are engraved in the background. A new release in our Disney Frozen coin collection. 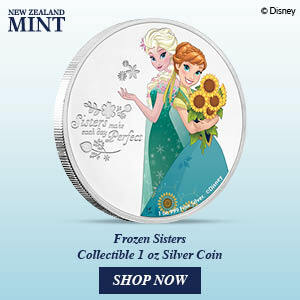 Colourful coin design portrays a lovely image of sisters Anna and Elsa happy together. Proof quality 1 oz fine silver coin. Presented in delightful storybook style packaging. Great present for any Disney Frozen fan, or your favourite sister! Click HERE to order this coin today!! !